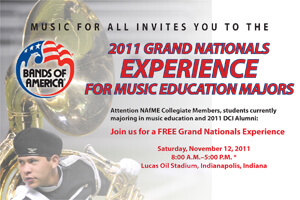 Drum Corps International strategic partner Music For All has issued an open invitation to any college students currently majoring in music education at the undergraduate or graduate level to attend the 2011 Bands of America Grand National Championship Semifinals for free! In addition to seeing the performances of some of the best marching bands in the country, attendees will have the opportunity to interact with future music educators in a special learning session led by author and professional speaker Fran Kick. The event takes place on Saturday, Nov. 12 from 8 a.m. to 5 p.m. at Lucas Oil Stadium in Indianapolis. Space is limited, so the complimentary reserved seats will be offered on a first-come, first-served basis. An RSVP is required to attend.